Like we said before, we must congratulate Jenn & Tony Bot for landing another production Kidrobot Dunny but this time a whole series! Our Artist Spotlight artist “The Bots” kept this under wraps until the vectors were leaked back in May HERE. Jenn & Tony Bot 3? Scared Silly Dunny series will be Halloween themed, don’t be too scared The Bots are uber cute. Remember vectors don’t do the final versions any justice but you’ll get the idea, hold on as yesterday non-vector images of the actual series have been seen. 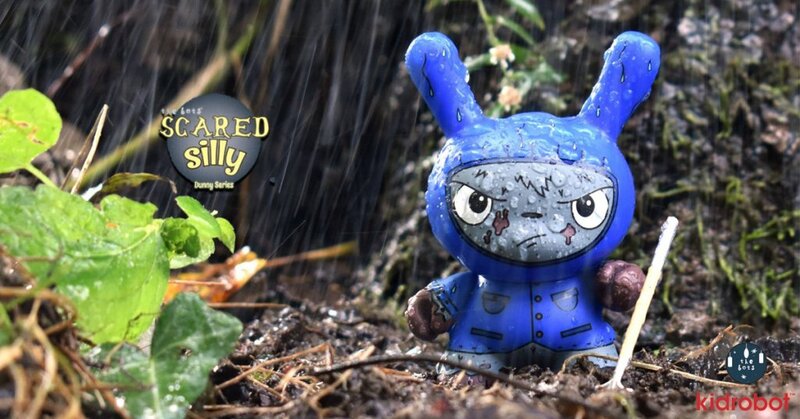 Conjuring spirits of Halloween in a story told like never before, Kidrobot and The Bots team up to bring you an all new Dunny Series: Scared Silly. This unapologetically cute, but slightly morbid series features memories and musings of the Halloween season. From your first costume, to a cabbage night tradition, all the way down to the fright of your life, there is something for everyone. Created in the style that “SCREAMS” The Bots, this series mixes the cute with the creepy. Collect them all today and prepare to be Scared Silly! What do you guys think of the first 3 designs? Love the theme and The Bots style but on personal preference has it lost some of The Bots charm without The Bots signature overlay of polymer clay with a full vinyl production from Kidrobot? Guess I’ll have to check them out in hand. Support your local vinyl retailer. Check out The Toy Chronicle Spotlight Jenn and Tony Bot HERE.